A healthy tea - time snack. Adding ginger and coriander seeds gives this snack a wonderful taste. Grind the moong dal along with ginger ,corinader seeds and salt . The mixture should be little coarse. Mix the chopped ingredients and curry leaves with the grinded paste. Heat oil in a pan and take a handful of the batter and drop them little by little using the tips of your hand. Deep fry them until golden brown and drain them in a paper towel. Very tempting pakodas. Love the click and the crispiness in the pic. 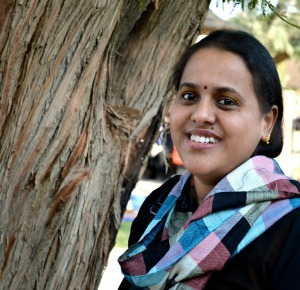 wow i love this recipe.Very innovative recipe...All the best Aruna. My all time fav. 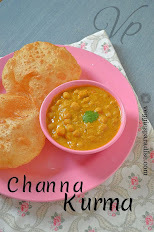 snack dear...with moongdal is a nice n healthy idea!luv the cute pic 222! 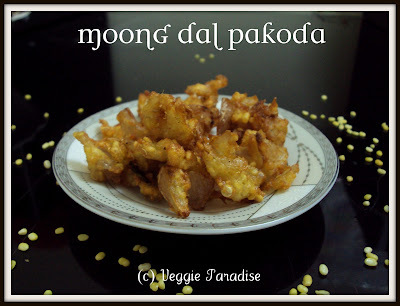 my family loves these pakodas...great entry for event! Wow! Yummy pakoda! It's tempting and appetizing! Nice for snack time! Crispy pakodas looks awesome Aruna..feel like munching it..
crunchy munchy!.. never tried this..
Wow pakodas with coffee or tea is a great snack to munch around in the evenings.Moong dal pakoda is so lovely aruna. Pakoda's looks crispy.... usually I make moong dal vada's,,never tried pakoda's..will try it soon..
something new for snacks. Thanks for sharing. ahealthy snacks..Used to prepare the pakoda with vegettables.this is good idea..
Have never made pakodas with Moong dal, am tempted to try seeing these delicious ones! Looks crispy and delicious. Perfect snack with a cup of tea. I make vadas with them but not pakodas. Everyday we learn new things thru blogger friends. Don't we? Healthy and easy snack. Dear please collect your awards at my blog. Crunchy yummy pakodas. Wonderful click. Nice snack, looks crispy and yummy. Congrats on your awards. nice photos and tempting pakodas. Pakoda and tea mmmmmmm yummy! hey crunchy munchy pakodas with tea..too delicious. Aruna, Who can say no to these Moong Dal Pakoda's and a cup of hot ginger tea..NOT ME !!!!. They look great and congratulations on ur award. So kind of you to share it with us. Looks very crispy...will be perfect with tea. thanks for visiting my blog. you left a comment abt accepting the award. i dont know what it means since am a new blogger. can you show me some light on that..
by the way your pakodas are very yummy and a good tea time sanck..
wow nice crispy n yummy pakodas...perfect with tea...yumm..
Pakoda looks crisp, perfect evening snack !! This is new to me and very healthy version too! 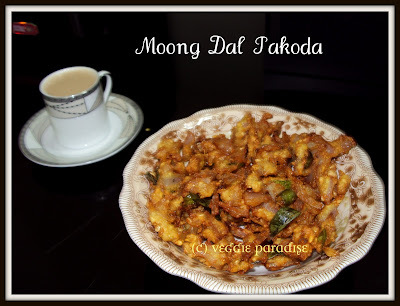 nice moong dal pakoda, healthy also.